during which time he and my daughter had to relocate across the country. He left before the ink was dry on the lease for their new place! 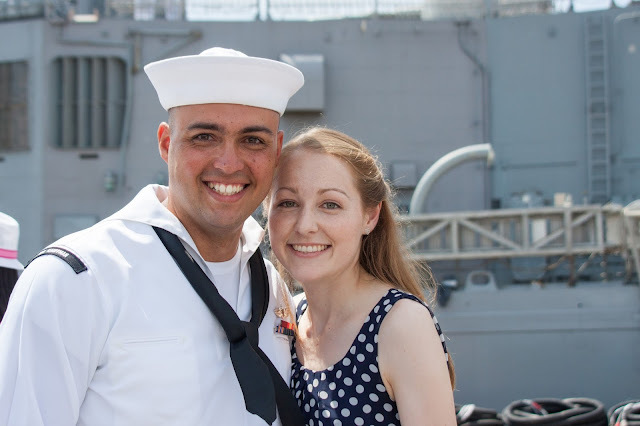 USS Kauffmann Homecoming in Norfolk, VA earlier this year. He will not be home for the holidays. Will you wish him and the ship's crew a Merry Christmas? leave a comment below and I will be sure he sees it. while we are enjoying good, random holiday fun. wishing you and your son (and his shipmates) and you family a beautiful Christmas + 2016! Cute couple! I hope everyone aboard ship has a great Christmas in spite of not being home for the holidays! Ahhhh... that's hard. We have been there many a times... our "big" transition in October was retirement from the military because they wanted to separate us again, this time for 20+ months... after 8 deployments we said no way. So, I totally get this. I'll be keeping your daughter and son-in-law in my thoughts for sure. Merry Christmas! I left them a nice Christmas wish. It's tough to be away at this time of year, but these are tough people. You must feel heartbroken about it. I wish Bud a Merry Christmas and a safe return home. My Dad left on many a deployment and I know how your families feel. Bless you all! Be strong and know your loved ones, and people you don't even know are sending prayers up for your safety and quick return home! Merry Christmas!!! Sorry he can't be home but thank you for his service! Wishing you all a Merry Christmas! That song always brings a tear to my eye. What a good looking couple! It is SO right that he and his friends realise that they are being thought about while they are away! Merry Christmas and a happy and peaceful New Year for you and your loved ones! Praying he stays safe! Wishing you and your family a Merry Christmas and a Happy New Year! That stinks that he won't be home for the holidays, but I am so grateful for the service of these fine young men. Stay safe and Merry Christmas. Hope they moved to a warm place (in winter), or...? A merry Christmas to all of you! Thank you to you son AND your daughter for their sacrifice and service. Wishing you and yours a joyous Christmas season. Thank you for sharing at Song-ography. That is a wonderful picture. And to answer your question about my "starts with k: post, I had a photo prompt earlier that week for starts with k and thought the necklace fit the prompt. I am late responding as I was getting ready to head out of town.